MUZISHARE X7 is an integrated Amplifier. This is a Power Amplifier too (there is a group pre-amp input). This is a Headphone amplifier too. This is a amplifier for Phono player too, direct link your phono player to this amplifier to output to speakers. The Upgraded Edition was recently launched. The internal coupling capacitor is specially designed by the designer to debug the silver film capacitor. The Upgraded Edition has extended details, control power and density. Muzishare X7 comes with an English User Manual, and a circuit diagram(Schematic), the Schematic of MUZISHARE X7 will come after you make an order. Provide Triode and Ultralinear selection function: Triode work mode, soft, pure and sleek, suitable for enjoying vocals, strings Music and other types of music; Ultralinear work, the sound of open, unrestrained, the momentum is good, for large scenes, large dynamic type of music. 6, peripheral power tube current adjustment knob and current display meter. 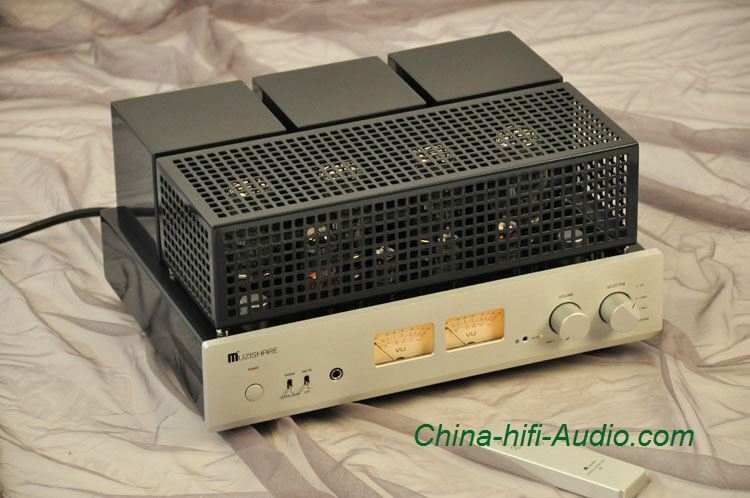 7, with pure power amplifier features, can be linked the pre-amp signal input. Power supply: 100V - 240V 60Hz/50Hz, 110V, 115V, 120V, 220V and 230V version are in stock. 100V and 240V version need to take 3-14 business days to order.